Advertising for Love: Run away! I am not crazy. But I do not like this man. 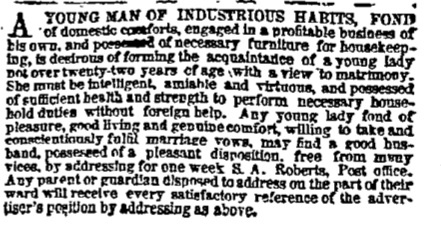 A young man of industrious habits, fond of domestic comforts, engaged in a profitable business of his own, and possessed of necessary furniture for housekeeping, is desirous of forming the acquaintance of a young lady not over twenty-two years of age with a view to matrimony. She must be intelligent, amiable and virtuous, and possessed of sufficient health and strength to perform necessary household duties without foreign help. Any young lady fond of pleasure, good living and genuine comfort, willing to take and conscientiously fulfil marriage vows, may find a good husband, possessed of a pleasant disposition, free from many vices, by addressing for one week S.A. Roberts, Post office. Any parent or guardian disposed to address on the part of their ward will receive every satisfactory reference of the advertiser's petition by addressing as above. OMG! Run ladies! Run away! This guy sounds awful! I don't know where to begin! The way he describes his circumstances, himself, as his future bride are so unappealing. Okay, okay, so for starters, he seems to think that furniture is the way to win his way to a woman's heart. Really, this is the thing he mentions right upfront. I'm not saying furniture isn't important. You can't live very comfortably without furniture. But shouldn't that be a given? Anyone who has the money to place a lengthy matrimonial ad and who says he has his own profitable business presumably has furniture! Is this a code for something else? Like a king-sized bed perhaps (did they have king-sized beds back then? I have no idea)? Or does he mean that the furniture he owns is really nice and a woman would be comfortable in it? That's my best guess - but it's also the least of my concerns. He says that any young lady fond of good living and genuine comfort would be happy with him, but also stresses that she has to have "sufficient health and strength to perform necessary household duties." That doesn't sound too comfortable or pleasurable. First of all, any indication that a woman needs "strength" to perform household duties implies that the household duties must be pretty hard, doesn't it? Even if that's not what he meant, it's certainly what I would take away. I know he just means he doesn't want a wilting flower, but that is NOT the way to appeal to any girl. Plus, the whole "without foreign help" bit. Well, thank you S.A. Roberts, for revealing your flagrant xenophobia. Granted many native-born whites didn't think too highly of the Irish at this point (the primary immigrant group to New York at the time and almost certainly the "foreign help" he's referring to, and possibly German as well), but they at least had the decency not to announce it. Jeez. Also, the bit about being "willing to take and conscientiously fulfil marriage vows," by which I assume he means the part about obeying her husband and submitting to his will, or whatever a stuck up prig like this thinks is wifely duty. Ugh. I like him less and less. And finally, he says he's free of many vices. Really? Not all? Because while I suppose I appreciate the honesty that he recognizes he's not perfect, he certainly seems to expect perfection from his wife. S.A. Roberts, I pity the poor girl who actually believed that tommyrot about you having a pleasant disposition. Maybe you thought you did, but somehow I don't think he'd be a fun person to be married to! 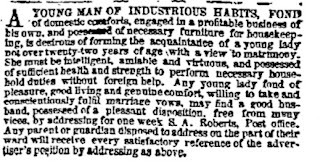 It's interesting that I interpreted two things in this add completely differently: 1), the "necessary furniture for housekeeping", and 2), "without foreign help". 1) I took to mean not "furniture in general" (as you seem to have done), but in fact things one would need for "comfortable" housekeeping - I don't know when this ad was published, but today I'd assume it means stuff like a dishwasher, a washing machine, a tumble-dryer, a vacuum-cleaner, that sort of thing. If any of these already existed when the ad was published, they were probably very modern - and definitely not something one would take for granted. 2) I took to mean "without help from outside the house", i.e. without hiring a housekeeper, kitchen aid, whatever. So it's not xenophobia, but rather some weird recluse who doesn't want anyone in the house who isn't family. Doesn't make the overall tone any better - he does sound awful, and I really, really wonder what vices he isn't free of... but at least those two points look completely different to me. But maybe that's a non-native speaker thing.